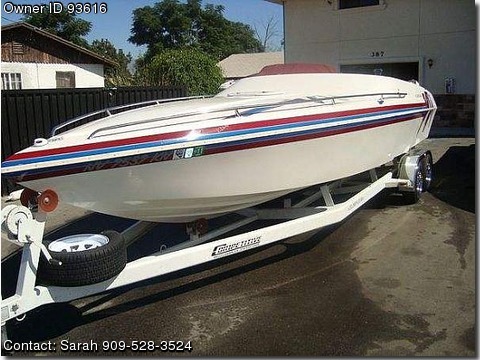 Call Boat Owner Sarah 909-528-3524. Description: 1997 502 Mag, 415hp. This great boat has low hours, trim tabs, Bimini top, dual batteries, electric hatch, premium CD sound system, Custom cover. Closed bow with two bench seats, bed area, and tons of storage space. It is perfect for overnight river trips. Has been recently serviced and is ready to take you 70mph. Comes with a dual axle Competitive trailer, new brakes and tires.